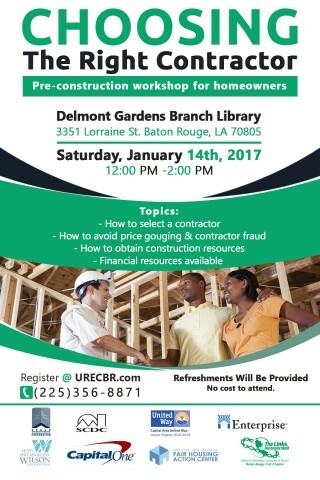 Join us for the Choosing the Right Contractor seminar on Saturday, January 14, 2017 from 12:00-2:00pm at Delmont Gardens Branch Library, 3351 Lorraine Street in Baton Rouge. As a special incentive to homeowners in attendance, event sponsors will give away a select number of gift cards to go towards the purchase of construction materials. Seminar sponsors include: Capital One Bank, Scotlandville Community Development Center, Huey and Angelina Wilson Foundation, Enterprise Community Partners, Capital Area United Way, Greater New Orleans Fair Housing Action Center, and The LINKS Inc. (Baton Rouge Chapter). 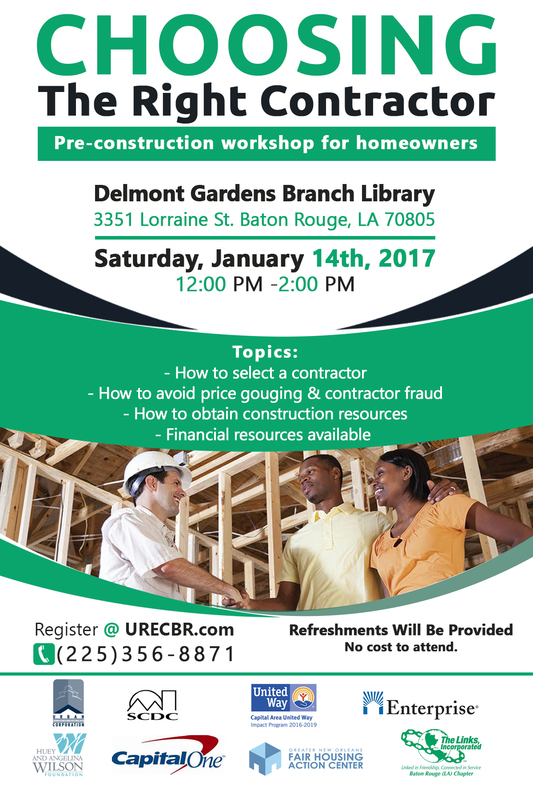 The Choosing the Right Contractor seminar is free to attend. Seating is limited, and pre-registration is required. Register here. Or, for more information email info@urecbr.com or call (225) 356-8871.